Once in his life, every man is entitled to fall madly in love with a gorgeous redhead! The most famous redhead of all speaks the truth. Little is more strikingly beautiful than the fiery red of the curls of an equally fiery woman. Lucille Ball let that show through even when she was just in black and white! Now, we can’t make the certain claim that it was her bright red locks that gave the woman her passion, her flair, or certainly her unparalleled comedic skills, but we can’t prove that it wasn’t her curious curls that gave her the magic, either! 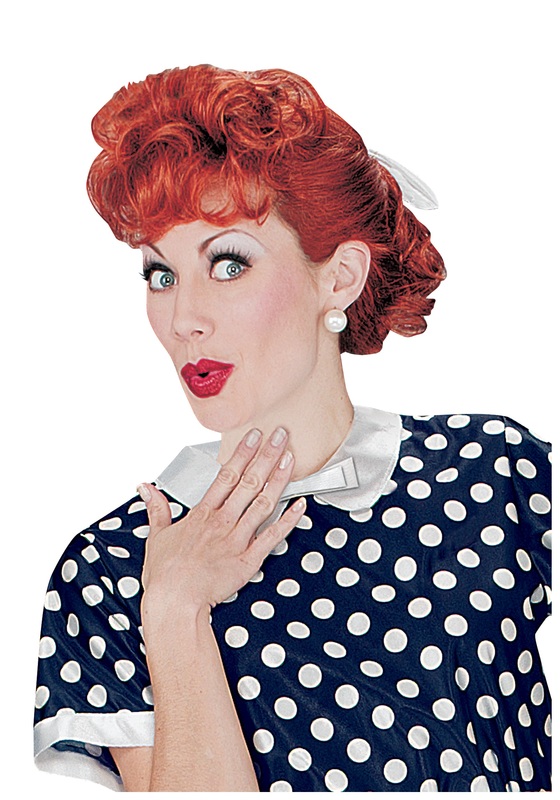 If you’re looking to channel the glorious charisma of America’s favorite comedian and give a magical night to your friends, perhaps it is in your best interests to transform more fully with this I Love Lucy wig. The styled and curly red hair is completely made of synthetic hair and lined in comfortable mesh, so neither wig nor locks of hair will fall out of place while your fantastic inner personality is only augmented by these crimson curls. Tie up a complementary blue bow and wear a stylish 1950s dress and you will be right there. Now you just need to find your Desi!